This kit provides an introduction to ionic interactions by giving students exposure to a large number of reactions and allowing maximum observation for a limited amount of time and effort. It includes precipitate forming, gas forming, and non-ionized product forming reactions. The investigation may be extended to teach students a number of additional basic chemical skills such as writing ionic formulas for the products formed, writing ionic interaction equations, relating placement of elements in the periodic table to their reactivity, and developing solubility principles from empirical evidence. 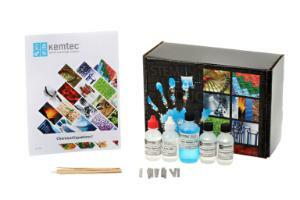 This kit is ideal for high school chemistry or physical sciences studies. Ordering information: This kit includes depression plates, toothpicks, plastic, calcium nitrate, potassium sulfate, cadmium nitrate, sodium silicate, cobalt nitrate, potassium oxalate, barium nitrate, potassium phosphate, cupric chloride, potassium chromate, potassium iodide, acetic acid, manganese nitrate, potassium hexacyanoferrate (iii) (ferricyanide), nickel nitrate, potassium hexacyanoferrate (ii) (ferrocyanide), strontium nitrate, silver nitrate, lead nitrate, ferric nitrate, zinc nitrate, chromium nitrate, aluminum nitrate , potassium bromide, potassium hydroxide, potassium chloride, potassium carbonate, and test tubes.